While I'm in the kitchen, I was planning to share the recipe for this delicious rice salad, but realized I don't really have one. It's one of those things that I just add to as I go along - not much measuring, but plenty of tasting. Over the weekend I made it for James and Maggie's holiday barbecue and some of the guests asked for the recipe. Here's a rough version that leaves you room for personal adjustments and variations. Cook enough rice to make about 3 or 4 cups of dry, fluffy rice. I cook a mix of wild (expensive but delicious!) and other rices in chicken broth flavored with garlic. Cool and place in a large bowl. Cook up several slices of bacon to CRISP and then saute a bunch of chopped scallions and a cup of chopped mushrooms in the same pan. (I pour off some of the bacon drippings and add a little olive oil as needed.) Crumble the bacon and add that plus the scallions/mushrooms to the rice. Then add 1/2 cup chopped sweet red pepper, 1/3 cup chopped walnuts or almonds, 1/2 cup chopped olives, 1 can rinsed and chopped artichoke hearts. Dress with a 3 /1 ratio of olive oil/white wine vinegar (or lemon juice). Toss well. Salt and pepper to taste (** I have never added salt because I love the taste of vinegar and that usually does it). Chill overnight and serve. I guess that's a recipe after all. It's a refreshing twist on the summer salad and will stand up to all kinds of ingredient substitutions in the same way that a pasta salad might. Once, long ago I made it for a dinner party (in the days when we did such things) and had a phone call bright and early the next morning. "Thank you for dinner last night. 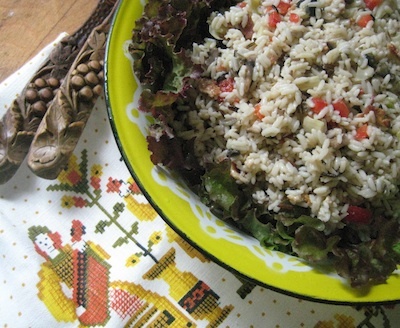 R. had a dream about the rice salad and asked me to call you for the recipe before we did anything else today." One of my favorite food compliments.